Images from the French city of Nice where dozens of people were killed when a lorry ploughed into a crowd celebrating Bastille Day. 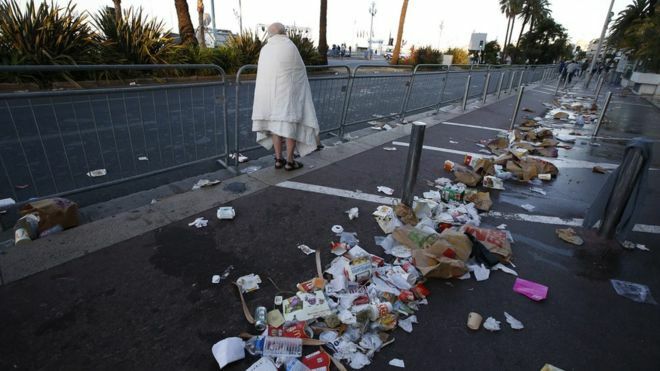 A lorry struck a crowd in the southern French city of Nice killing dozens of people, some of them children. The lorry’s windscreen was full of holes from bullets thought to have been fired by security forces, who said they had killed the driver. They said guns and grenades were found inside the vehicle. 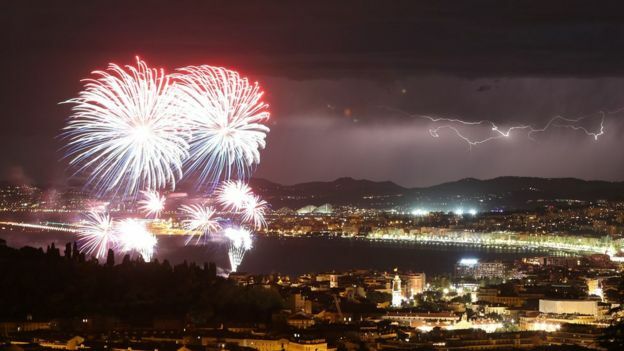 Nice had been celebrating France’s national day with fireworks when the attack happened. 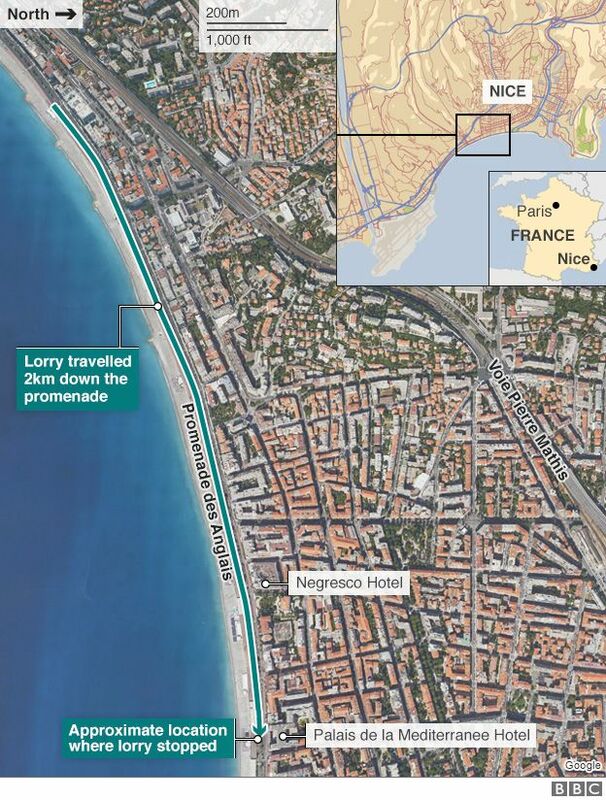 On the famous Promenade des Anglais, the lorry drove 2km (1.2 miles) through a large crowd. The emergency services arrived at the scene shortly after. Scores were killed, with many more injured. French officials asked people to stay indoors. Witnesses said the speeding lorry swerved and zigzagged in an apparent attempt to hit more people. 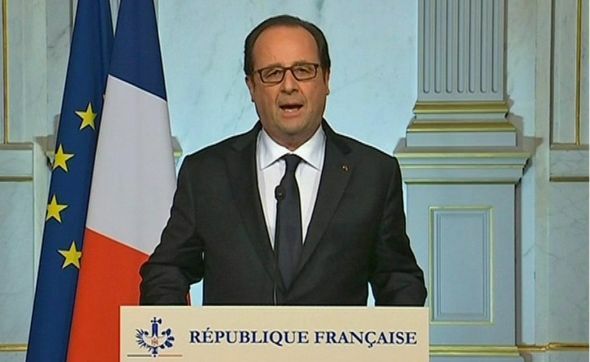 French President Francois Hollande made a televised address in which he called the incident a “terrorist attack”. 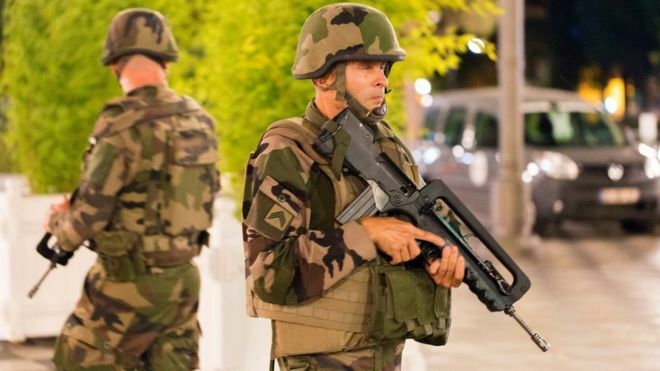 Soldiers have been deployed in Nice. 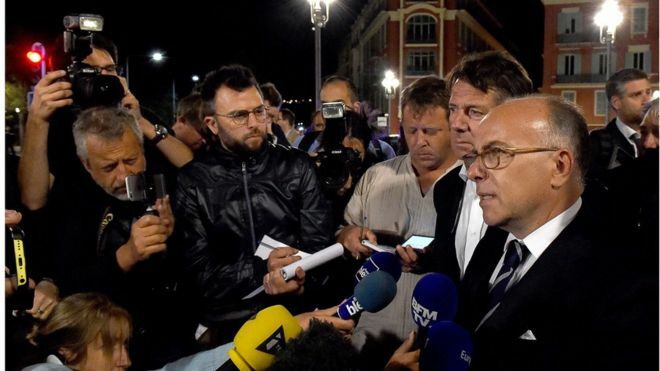 French prosecutors said they had launched a terrorism investigation. On Friday morning, debris from the night before lay beside the road. Flags in France are flying at half-mast, and Nice’s jazz festival has been cancelled. The terror began a little after 22:30 (20:30 GMT) on Thursday, shortly after thousands of people had watched a firework display on the seafront in Nice, at the end of a day marking France’s national holiday, Bastille Day. 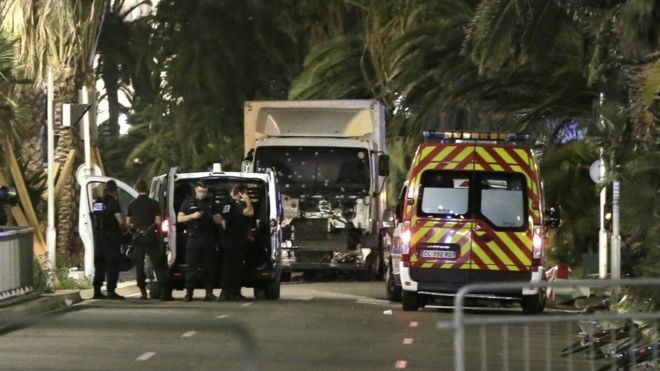 As families strolled along the city’s renowned Promenade des Anglais, a large white lorry careered at full speed towards them. The vehicle mounted the kerb then went back on the road, zigzagging for up to 2km (1.25 miles), as the driver intentionally drove into the crowd. 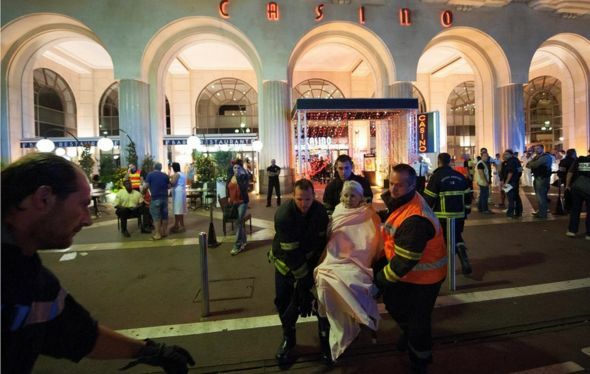 “I was opposite the Palais de la Mediterranee when I saw a lorry at high speed running over people. I saw it with my own eyes, people tried to stop it,” said one witness. The driver opened fire on people in the crowd, according to local reports. Police fired back and the driver was eventually shot dead. Images from the scene showed the windscreen and front of the lorry raked with bullets. Interior ministry officials said the attacker had been “neutralised”. Who was driving the lorry? The driver has been identified locally as a 31-year-old man of Franco-Tunisian origin from identity papers found inside the lorry. He was named locally as Mohamed Lahouaiej Bouhlel. Police are yet to confirm the details, but were said to be searching his home in Nice. 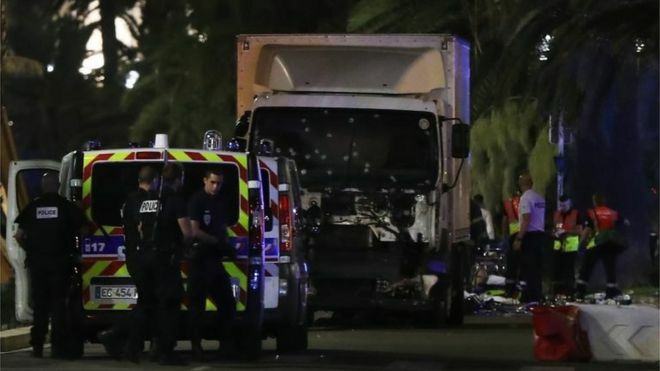 The attacker was said to have hired the lorry from a rental in Saint-Laurent-du-Var, a town to the west of Nice two days earlier. They also found guns and a grenade inside the lorry, but later said these were fake. However, he was armed with a pistol, and had opened fire on police before being shot dead. It was not initially clear if he was acting alone. There were rumours, which later proved to be false, that hostages had been taken in two nearby hotels. Residents were told to stay indoors amid fears of more violence. 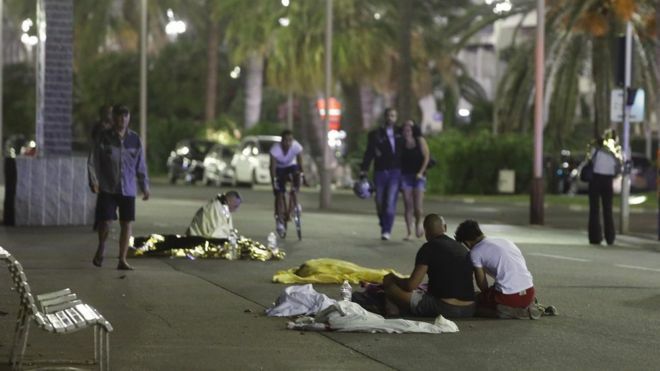 Nice residents and tourists alike were caught up in the attack. It was clear that some of those who died were children, taken to the seafront by their parents to see the Bastille Day firework display. Of the dozens of people wounded, as many as 54 were children who were being treated at Lenval children’s hospital in Nice, reports said. 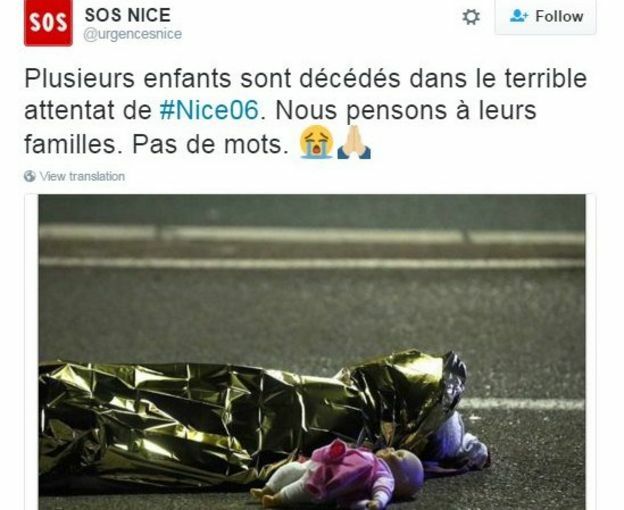 Among the 84 who died, according to reports, was the assistant head of the Nice border police, Jean-Marc Leclerc. In the hours after the attacks, lists were posted on social media of people missing since Thursday night. Among the many names were Estelle, Morgane, Alphonse, Lea (aged seven) and Eva (aged nine). How have the authorities reacted? It soon became clear that many people had died, although the full scale of the disaster was unclear. 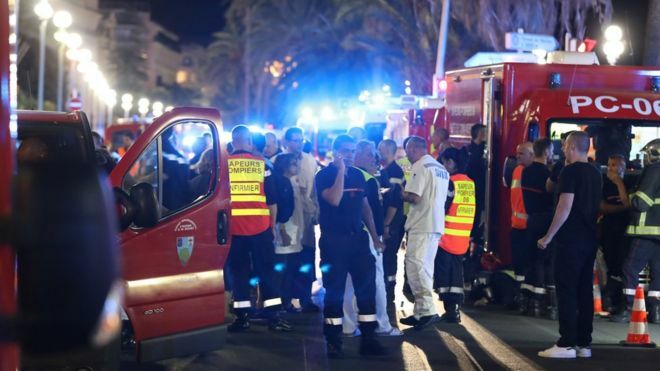 The dead and injured were taken to the local Centre Hospitalier Universitaire de Nice. The hospital launched its crisis mode for exceptional health situations and put out an emergency number for families: 00 33 (0)4 93 72 22 22. 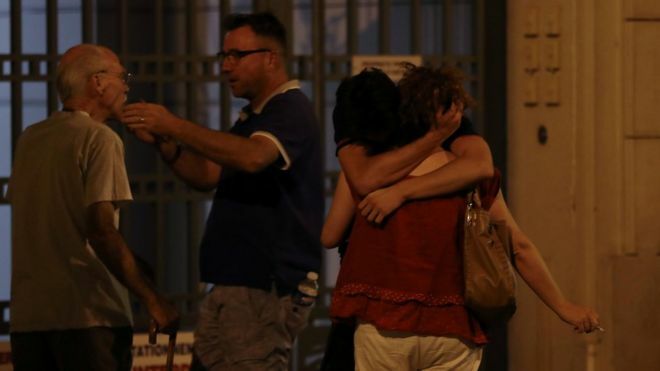 In the area around Nice, the anti-terror alert has been raised to its highest level. President Francois Hollande was flown back to Paris from a visit to Avignon, joining Prime Minister Manuel Valls in a crisis room. Mr Valls declared three days of mourning starting on Saturday. 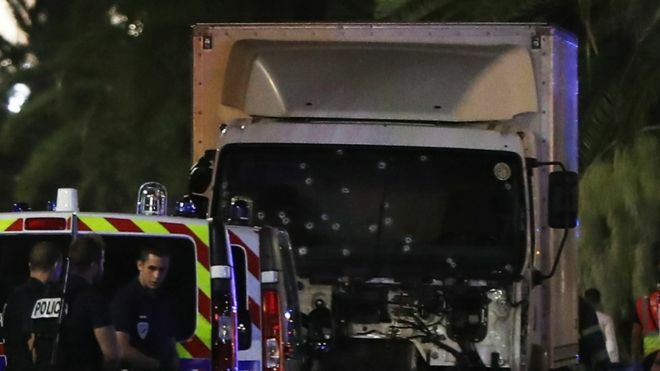 It was not long before President Hollande said it was “an attack whose terrorist nature cannot be denied”. Anti-terrorist prosecutors in Paris have launched an inquiry for murder and attempted murder as part of an organised terrorist strike. 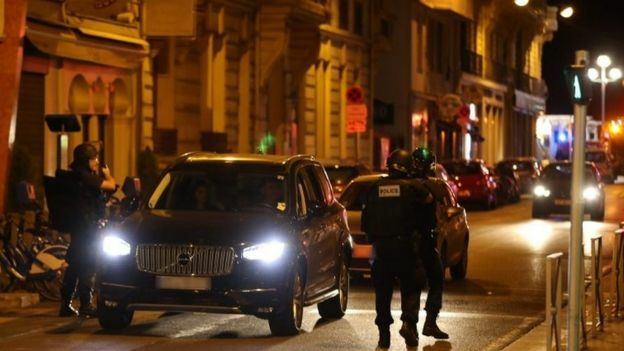 Earlier this week, France’s DGSI internal security organisation warned of the danger of further attacks from Islamist militants with “booby-trapped vehicles and bombs”. Although so-called Islamic State has not yet said it was behind the murders, it has targeted France on several occasions since January 2015. 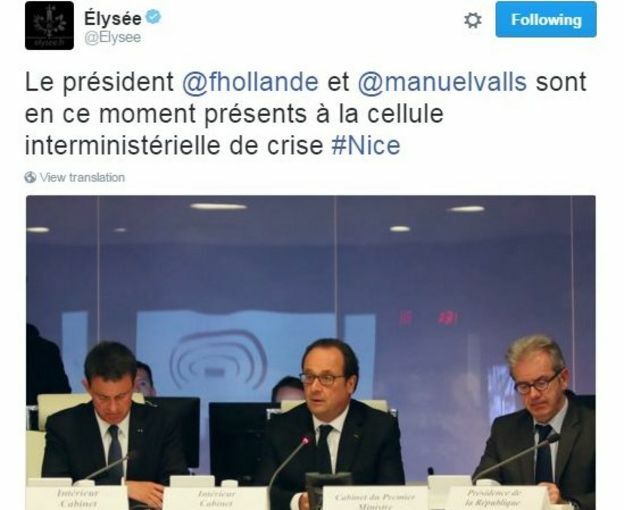 Only hours before the Nice attack, President Hollande had announced that France’s state of emergency would be removed later this month. He later announced it was being extended.